Today, VitaScans, the developers of TouchStone, 'the Little Voice Inside,' announced that they will send TouchStones, free-of-charge, to any celebrity that requests one, to help them better navigate the 2007 holiday season. 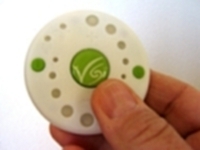 The Touchstone, a tiny battery-powered, hand held disk that uses a combination of biofeedback and muscle testing techniques, as practiced by complementary health practitioners, including psychologists, across the world, can be used anywhere to translate a subconscious feeling, or 'the little voice inside.' "Think of it as a portable electronic Dr. Phil," said Mackeonis, the Touchstone's main architect, continuing, "because the TouchStone helps individuals hone in and focus on what their minds and bodies are telling them in relationships, life balance and wellness. Vitascans came up with the idea of giving away TouchStones to celebrities after 'corporate gifting' company Distinctive Assets asked them to provide TouchStones for Oscar 2008 and Grammy 2008 nominee's gift bags. Vitascans decided that as celebrities are admired by so many people and have the power to influence millions of kids, not only through their appearance, but by their behavior, that maybe having a tool to help them make better decisions would be beneficial. Having a visual representation of whether a choice is potentially beneficial, neutral or detrimental, through a series of green, amber or red lights might give them some personal insight before they do something rash: "Is partying again tonight good for me?" or "I've had a few drinks, should I drive to In-and-Out for a burger?" or perhaps, "Should I marry K-Fed?" A Vitascans spokesperson commented, "The visualization of flashing red or green lights could save celebs a lot of trouble, by giving them a tool to help them think twice." Vitascans altruistic holiday season's celebrity gifting acknowledges that we all live in a complex world, even more so for young celebrities who don't seem to have a clear path to their inner voice, and, as a result, often make bad decisions, and they want to help. "The news is always full of celebrity woes, and that's not good because children, teenagers, as well as young adults look up to these people, "said Mackeonis. "But in their defense, it can't be easy being as famous as Amy Winehouse, Britney Spears, Lindsay Lohan, Nicole Ritchie or Paris Hilton, because everyone around you is going to say yes to anything they say or want to do. It takes a strong personality to control this kind of complete freedom, and those who can't, often find themselves in conflict with the law, or worse." As far as confidentiality is concerned, VitaScans has already supplied TouchStones to a number of world famous personalities and their identities will remain confidential, and any newly interested celebrities or agents should contact Lisa at on 831-840-3729 to have a Touchstone FedEx'd to them overnight.